Missed the HGTV Smart Home Giveaway? 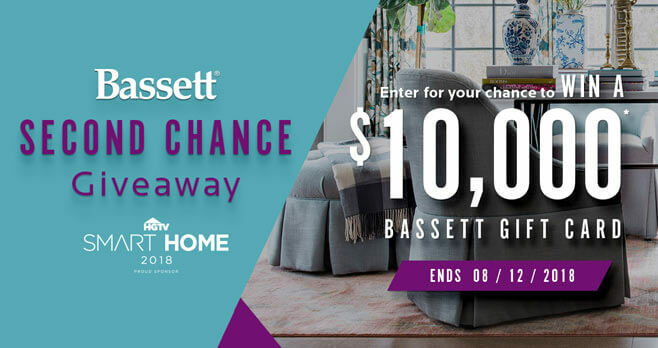 Enter the Bassett Second Chance Sweepstakes and you could win a $10,000 Bassett Gift Card. Enter each day through August 12 to increase your chances of winning. Ends: Ends at 11:59 pm ET on August 12, 2018. Prize: A $10,000 store credit to a Bassett Home Furnishings store will be awarded to the Grand Prize Winner. Eligibility: In order to be eligible for entry into the Bassett Second Chance Sweepstakes, you must be a legal resident of the 50 United States or the District of Columbia and 18 years or older and reside within the delivery radius of a Bassett Home Furnishings store location throughout the Sweepstakes Period and awarding of the prize.